Many people think that UPS is a magic box that solves all the electrical problems. 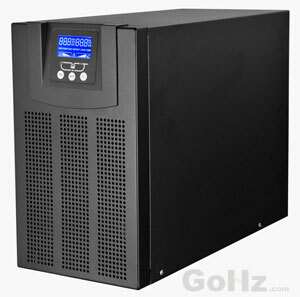 UPS systems have capacities varying from few hundreds of VAs to massive kVAs. The only thing that is worth noting in a UPS system is that, it can be viewed as a source as well as a load. Depending upon the configuration, the grounding needs to be planned. If the UPS system is transformer based, and operating only in inverter mode (Frequency converter mode), then it is called as separately derived source and output neutral should be grounded. If the UPS is not configured as a separately derived source (Bypass source is available), then whether the UPS has transformer or transformer-free, the output neutral should not be grounded. Newer systems having IGBT front ends transformer-free uses input neutral (3 phase of large capacity) also. For such configurations, output neutral cannot be earthed. As a standard installation practice of UPS there is no separate earthing is required from system point of view. Of Course, UPS panel shall be earthed for safety reasons. The system earthing for the load distribution gets the earthing via service switch of UPS scheme. UPS input particularly converter section always consists of 3 phases only. The UPS static bypass switch also consists only 3 phases. The service switch comprises 3 phases + neutral of the system which will be brought forward to the load distribution board. As an international standard practice, the neutral is always brought via the knife switch and the rest 3 phases via a breaker or disconnector. Also, at output of the service switch, the neutral is connected via knife switch. This is so that there shall be continuity of the neutral. As far as UPS Inverter section is concerned either isolated or non-isolated type, the inverter section is always built with 3 phase output only. Particularly with PWM technology, it is very hard to design the 4 wire system. Hence, UPS output always consists 3 phases only. The Inverter accepts the unbalanced load i.e. difference in phase currents without the floating neutral. The technology accepts the different in leg currents of the inverter. To cater for the phase to neutral voltage, UPS takes as reference of the system neutral. The neutral must be earthed i.e. the system neutral and the UPS neutral are being brought at the same level. This is the correct meaning of the UPS to be earthed. Theoretically, UPS need not be earthed but practically the system neutral shall be referenced. Depending upon the UPS configuration one has to consider for merging of the system neutral. It is silent on the type of body earthing for UPS-Cu/GI pipes.